There were 35mm still cameras before the Leica, but it was the Leica that created 35mm as a still photography format. Introduced in the mid-1920s, the original Leica had a fixed 50mm lens, shutter speeds from 1/20 to 1/500 second, and a simple tubular viewfinder perched on top. But the camera advanced quickly: first came interchangeable lenses, then in 1932 a coupled rangefinder was added. The next year, a dial was added to the front to provide additional slow speeds to 1 second, and finally, in 1935, the top speed was increased to 1/1000 with the introduction of the IIIa, above. Up to this point, the dimensions of the Leica had not increased from the original model A of 1925 ... and from this point forward, no new features or capabilities would be added to the camera until the IIIf (below) introduced flash synchronization in 1950. For me, therefore, it is the IIIa that best exemplifies the original Leica concept. The IIIf, as the highest stage of development of the original Barnack design, is my favorite of all Leica models (although I might be persuaded in favor of the M3 if I could only afford one). Part of the reason for the rapid advancement of the Leica through the early 1930s was competition from rival Zeiss Ikon. The first Zeiss Contax made its appearance in 1932 with a built-in, wide base rangefinder, bayonet mount lenses and a burn-proof all metal shutter speeded from 1/25 to 1/1000 second. Each improvement in the Leica was met with a matching advance by the Contax; slow speeds (to 1/2 second) were added in 1933 as the Contax I evolved through several variations. Carl Zeiss had the edge in lens design as well, particularly in high speed formulas like the 85/2.0 and 50/1.5 Sonnar for which Leitz had no equals, and the metal shutter curtains of the Contax would not burn through if the camera was left with one of these high powered optics pointed at the sky. 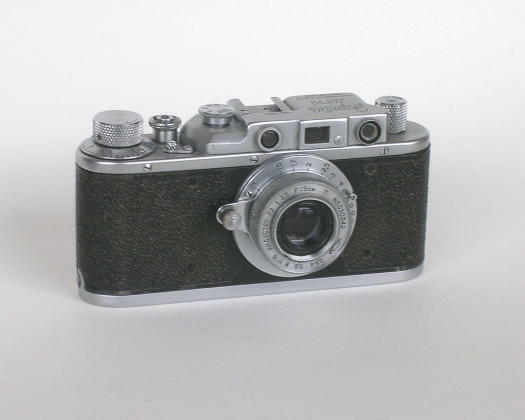 Then, in 1936, Leica was left in the dust by the introduction of the Contax II (above). 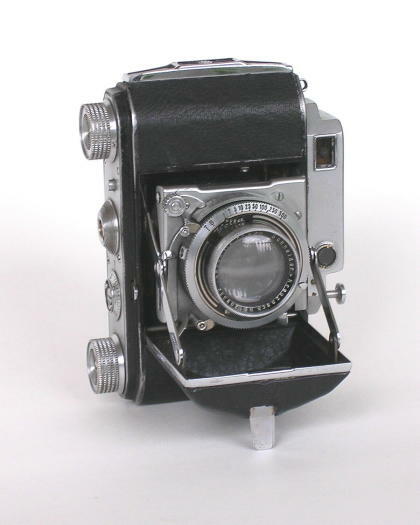 Handling and durability were improved over the previous models, and there were major advances in features: most notably, the wide base rangefinder was enlarged and incorporated into the viewfinder window so that the photographer no longer had to focus and compose separately. A self-timer was also added, and it was designed so that it could be used to provide an additional 1 second speed for the shutter. This was a camera that would not be equalled by Leica for nearly twenty years. almost adding insult to injury, Zeiss Ikon followed the Contax II almost immediately with the Contax III - the same camera with a photoelectric exposure meter built in on top. A bit cumbersome by today's standards, it was a real advance in the 1930s, and more compact than carrying a Weston around your neck along with your camera. World War II left Zeiss Ikon in disarray. The fire bombing of Dresden in February 1945 had destroyed the Contax factory and the engineering documents, and when the war ended a few months later the city found itself in the Soviet zone of occupation. 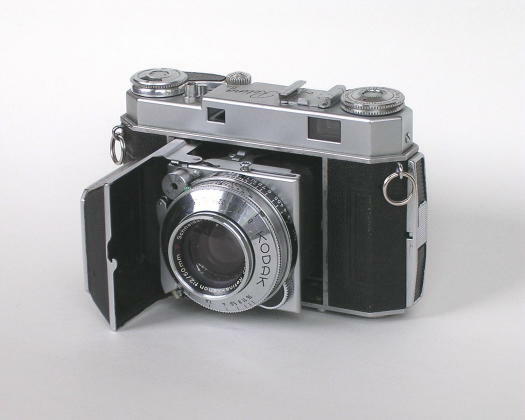 Rights to the Contax camera, once the design had been reconstructed and the facilities rebuilt, passed to the Soviet Union, and Zeiss Ikon personnel went to work on the design of a new single lens reflex. 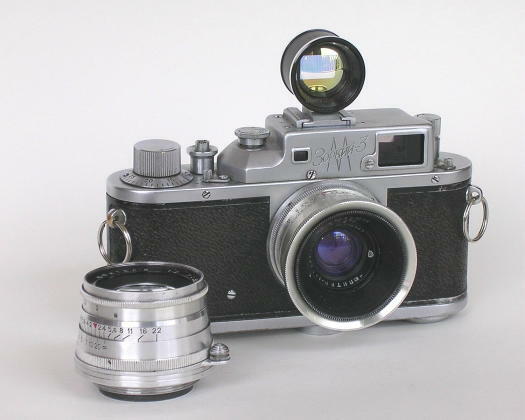 In the west, other Zeiss Ikon engineers began to design an all new Contax rangefinder for the postwar market, taking into account criticisms that the prewar camera had faced in its competition with the Leica. 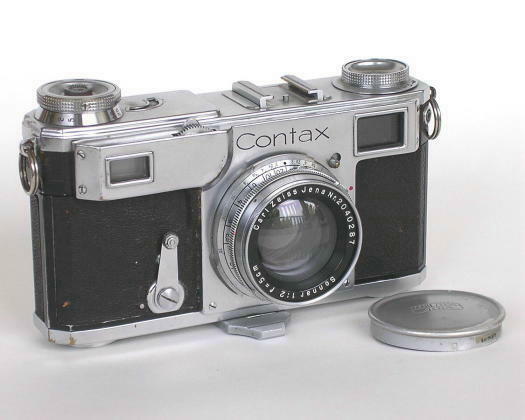 When it was unveiled in 1950, the new Contax IIa (above) was significantly smaller and lighter than its predecessor and included a full 1-1250 range of speeds on its nonrotating shutter speed dial. It was also quieter and smoother in operation, and synched for either bulb or strobe flash by means of a fairly neat screw-in adaptor cord. It retained the original bayonet lens mount system and was compatible with every prewar lens except for the 35mm Biogon, and it came with a series of new, recomputed and improved lenses. A meterized IIIa would soon follow. 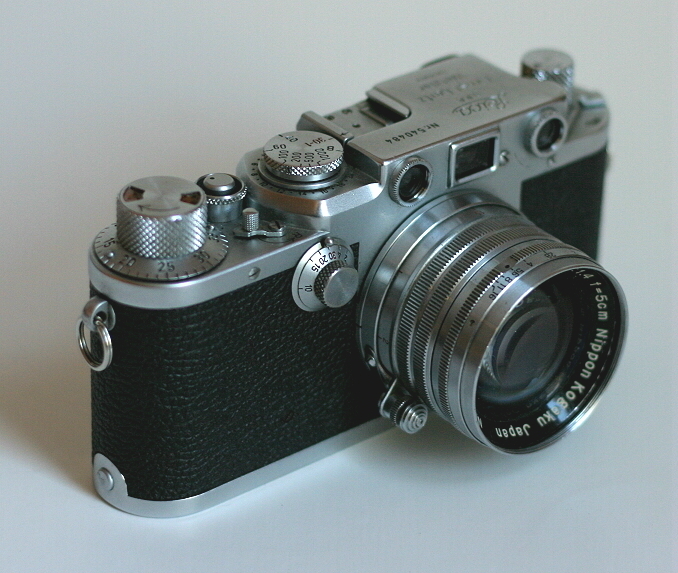 The IIa was a very attractive package when held up against the new Leica IIIf. 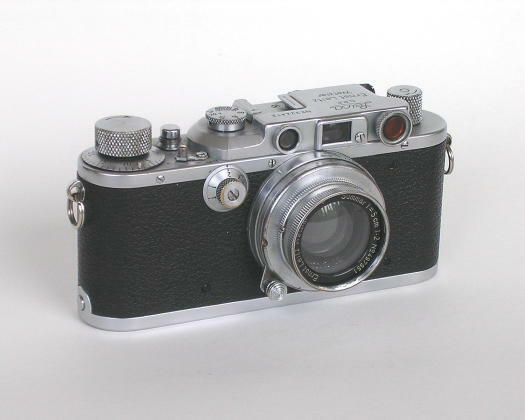 There were some negatives, though: in the redesign, the cylindrical rangefinder lens had been changed to a spherical one and so lost its immunity to vertical misalignment; and the all new shutter design, while quieter and retaining the burn-proof metal curtains of the prewar model, was no longer fade-proof. 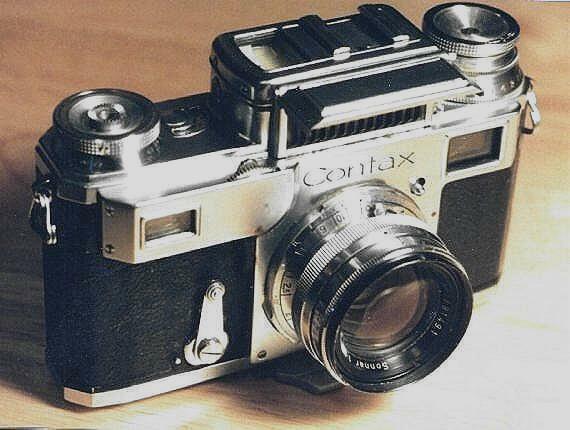 More significant than these, though, was the fact that, for the Contax, this was the end of the line. While Leica continued to advance with the IIIg and the M3, and Japanese competitors Nikon and Canon came on the scene with series of ever-improving models, there were no more cards up Zeiss Ikon's sleeve. 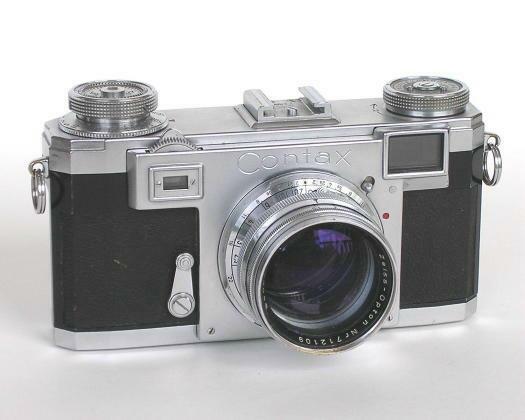 Except for a 1953 change from the screw-in adaptor cords to a standard PC flash connection, there was no difference between the first Contax IIa of 1950 and the last of 1962. Aside from Leica and Contax, there were no major contenders with interchangeable lenses and focal plane shutters in the 1930s. There were, however, other rangefinders, and one of the most significant was the Retina by Kodak AG. Like the Leica, the Retina began life as a simple viewfinder camera with an f/3.5 lens, but, also like the Leica, it quickly grew in features and capabilities. Just three years after the first Retina came the Retina II shown here, with a coupled rangefinder and a fast f/2.0 Schneider Xenon lens. Building a coupled rangefinder into a folding camera is no simple task, and Retinas are among the best. One of the most important features of the Retina, though, is not in the camera itself but in its film load: for this camera, Kodak developed a new, disposable film cartridge so that users would not have to load their own reusable cassettes in the dark as they had to do with Leicas and Contaxes. They also designed this new cartridge so that it would FIT existing Leicas and Contaxes, and overnight 35mm was no longer a toy for the idle rich with time to spend loading spools in darkrooms but had become a practical format for the mass market. As much or more than the Leica and Contax, the Retina and its standardized 35mm film load were responsible for creating 35mm as a still photography format. Excellent camera designers and builders that they were, the folks at Kodak AG were pretty bad with names. In the years before WWII there was a Retina II, and then a Retina IIa; and after the war there was another different Retina II, and then another different Retina IIa - and this was all before they had the unique inspiration to follow up their IIIc with the IIIC. This Retina IIa, though, is the one inroduced in 1951, and it is one of the best Retinas ever. 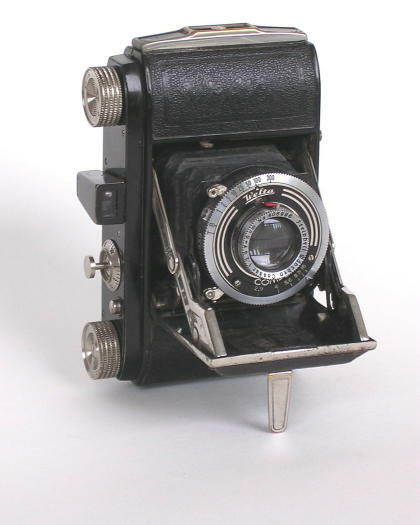 With a rapid wind lever taking care of film advance and shutter cocking, and a combined single-window range/viewfinder, it is much more convenient in operation than the prewar II; and still being based on the original Retina chassis of 1934, it is small enough to fit in a pocket if you don't wear your jeans too tight. The lens is still the f/2.0 Schneider Xenon, a design which benefited measurably from the advent of antireflective coating after the war, and the Compur shutter is now synchronized for flash. Though the Retina was the clear leader in folding 35mm cameras, it did have some competition. One of the earlier challengers was the 1937 Welta Weltini, shown here. 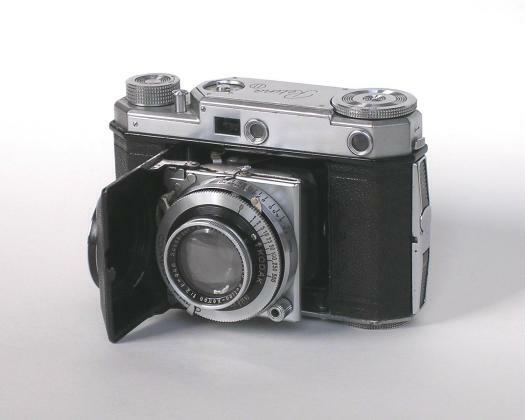 The Weltini had the same Xenon lens and Compur shutter as the Retina II, and like the top-line Retina it featured a coupled rangefinder. The Weltini was a bit more advanced than the Retina in some respects: ahead of Kodak and just a year behind the Contax, it featured a combined range/viewfinder, and where the Retina required you to return the lens to infinity focus before folding, the Weltini returned it for you as you closed the front. One thing it did NOT offer, though, was double exposure prevention. The direct ancestor of the Weltini was the Weltix, a worthy competitor of the original Retina. Probably the slickest feature of this pocketable little scale-focuser was a 2-position parallax correcting viewfinder. 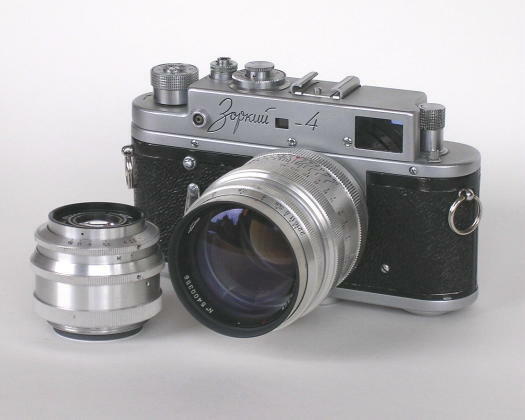 The Soviet Union got into the 35mm rangefinder business with copies of the Leica II, originally with the FED and then the Zorki. The Zorki-1 above is a decent camera, with most of the charm of the original Leica but without the smoothness of operation and fine finish. From its start as a Leica clone, the Zorki evolved in its own way. Slow shutter speeds were added with a Leica-style front dial in the Zorki-3, but this was soon followed by the 3M above which managed to get the entire range of speeds into the single top dial. The 3 and 3M also introduced a full-size viewfinder with diopter adjustment. All it lacked by this point was flash synch. This last shortcoming was addressed in the Zorki-4, which added a fully adjustable flash synch system, similar to that of the Leica IIIF, to the mechanics of the 3M. There was little left to improve from this point on, and the Zorki 4 and the lever-wind 4K remained in production for decades.